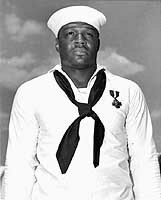 Doris Miller, known as "Dorie" to shipmates and friends, was born in Waco, Texas, on 12 October 1919, to Henrietta and Conery Miller. He had three brothers, one of which served in the Army during World War II. While attending Moore High School in Waco, he was a fullback on the football team. He worked on his father's farm before enlisting in the U.S. Navy as Mess Attendant, Third Class, at Dallas, Texas, on 16 September 1939, to travel, and earn money for his family. 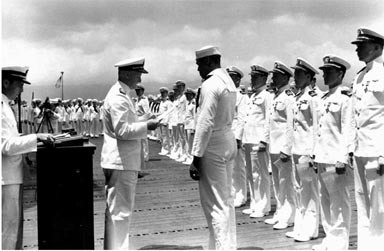 He later was commended by the Secretary of the Navy, was advanced to Mess Attendant, Second Class and First Class, and subsequently was promoted to Ship's Cook, Third Class. Following training at the Naval Training Station, Norfolk, Virginia, Miller was assigned to the ammunition ship USS Pyro (AE-1) where he served as a Mess Attendant, and on 2 January 1940 was transferred to USS West Virginia (BB-48), where he became the ship's heavyweight boxing champion. In July of that year he had temporary duty aboard USS Nevada (BB-36) at Secondary Battery Gunnery School. He returned to West Virginia and on 3 August, and was serving in that battleship when the Japanese attacked Pearl Harbor on 7 December 1941. Miller had arisen at 6 a.m., and was collecting laundry when the alarm for general quarters sounded. He headed for his battle station, the antiaircraft battery magazine amidships, only to discover that torpedo damage had wrecked it, so he went on deck. Because of his physical prowess, he was assigned to carry wounded fellow Sailors to places of greater safety. Then an officer ordered him to the bridge to aid the mortally wounded Captain of the ship. He subsequently manned a 50 caliber Browning anti-aircraft machine gun until he ran out of ammunition and was ordered to abandon ship.